Another classic piece to add to your wardrobe, and at the same time, add to the coffers for breast cancer research! Scoop and the CFDA have teamed up to issue this $98 ballet flat to benefit Fashion Targets Breast Cancer, a charitable initiative of the Council of Fashion Designers/CFDA Foundation, Inc. 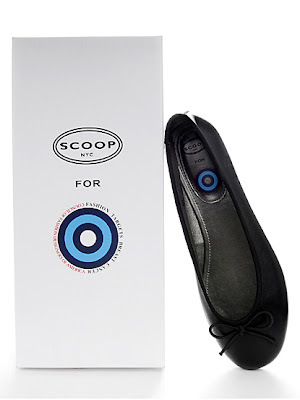 Grab a pair at any Scoop retail store, select boutiques selling Scoop merchandise and through Scoop NYC.com! wow that's a pretty expensive pair of ballet flats..P4,410 bucks (with a $1=P$45 exchange rate) for something i can buy in manila for P500. but i guess if the proceeds go to cancer research, then it's all good! Hi nikki! Yeah, it is quite pricey! But compared to regular Scoop ballet flats, this is much cheaper na as those go for over $100. Plus it's for a cause pa! If only I did not own several ballet flats, I might just buy this, hehehe!